Mark R Johnson is a roguelike developer, a retired professional gamer, a danmaku world champion, and soon to be a postdoctoral fellow in game studies at the UK’s University of York. The audience for danmaku games is generally consigned to two groups of individuals: those players (predominantly Japanese) who seriously compete for world records, and those who then watch those same world records on Youtube, marvelling at how anyone can possibly navigate their way through up to a thousand on-screen bullets that form a seemingly impossible wall of danger (danmaku translates approximately as “bullet curtain” or “bullet hell”, an appropriate term for the more challenging examples of this genre). In most danmaku games the core gameplay loop consists of memorizing the sequences of lesser foes in the levels preceding bosses, the attack patterns of bosses, and and deducing the best way to face them; the danmaku game Warning Forever, however, is a rare instance where the bosses react to the player’s attacks. This piece explores this inversion, the player’s ability to manipulate the bosses, and how this metagame develops as the player comes to understand the boss reactions to higher and higher levels. 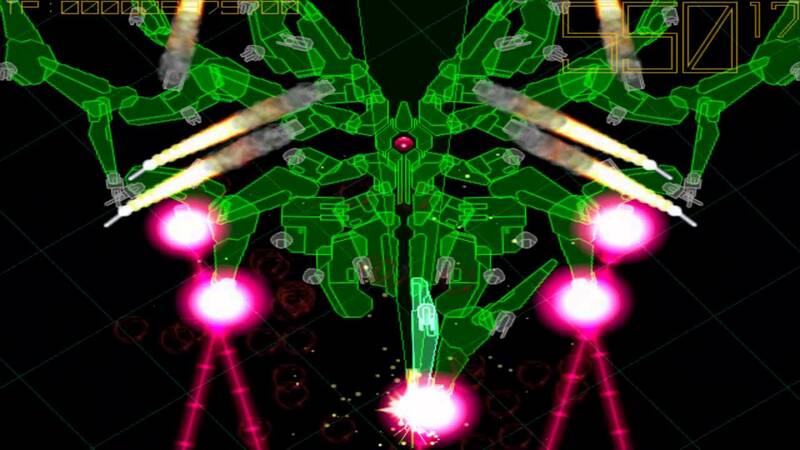 Most danmaku games share certain commonalities: a number of stages, each of which has a boss at the end, and all bullet patterns in danmaku games can be readily broken down into three core archetypes. Firstly, the “fixed” bullet pattern: in this case an enemy spawns, fires a set pattern of bullets (say, a stream at a 135 degree angle and a second stream at a 225 degree angle, if we take the top of the screen to be 0 degrees), and then leaves the play area. The second is the “random” bullet pattern: these are created by enemies who fire a semi-random stream of bullets in a particular direction. The third is the “aimed” bullet pattern: in this final case the bullets fired by an enemy are aimed specifically at the player’s current location (or the enemy fires a wider bullet pattern whose “centre” is aimed at the player), and is therefore different on each playthrough based on the player’s location. Examples of all three (random, fixed, and aimed) can be seen in the diagram below, taken from the danmaku game Score Rush. However, Warning Forever (produced by Hikoza Ohkubo) marks a strong disjuncture with these expectation. There are no “stages” – only an endless sequence of bosses, which continue until the player is out of time, or lives, depending on the game mode. Each of these bosses is “modular”, and contains: a number of arms connected to the main body, which each often have their own joints from which stem other “arms”, extending to potentially several “layers” of limbs; a range of weapons; and also potentially thrusters, extra armour, and various other comparatively rare adaptations. The first boss, and the “core” of each subsequent boss, is known as the Pure Heart, and it adapts and changes based on how the player attacks each new boss. If the AI notes that the player finds lasers far harder to dodge (i.e. 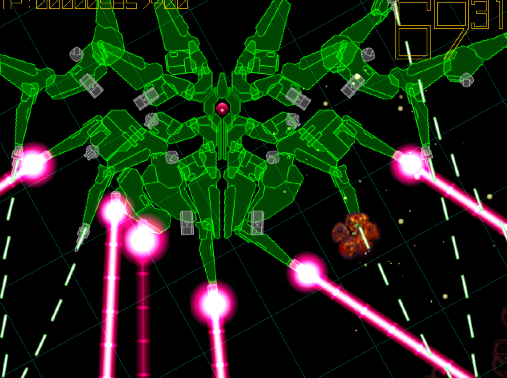 resulting in more player deaths) than the other weapons, players will more frequently encounter a sequence of laser-wielding bosses. If the player attacks the front of the boss more often than any other angle, extra armour will appear on the front in later iterations. If the player attacks the core of the boss without killing all the other wings first, the Pure Heart will become stronger; if not, the Heart will remain relatively low on health whilst the rest of the boss expands. Each boss builds on what the AI thinks the player has been up to in the previous iterations; the sequence of bosses a player encounters are therefore unique each playthrough (unless the player plays absolutely identically on multiple playthroughs), although the game always begins from the same initial seed. This system creates an interesting dialogue between the AI and the player, where both compete to produce strategies against the other. As the player’s attack methods change, the bosses will adapt to throw something more difficult at the player, tailored to how the game’s AI thinks the player is behaving; as the bosses evolve, new challenges therefore emerge, with unique layouts of weapons (and the shape of the boss itself) affecting the player’s chances of success. Some “macro” evolutions – those the game calls “the berserker” and “the phoenix”, for example – can often result in bosses that take up massive areas in the centre of the screen, forcing the player to one side or the other. Others like “the asura”, “the scorpion” or “the hekatoncheir”, meanwhile, try to “trap” the player in the middle of the screen and make it challenging for the player to move to the edges. Some bosses will also gain thrusters which allow them to move rapidly towards an edge of the screen, requiring the player to evade the entire boss or be crushed, a lesson which then impacts upon how the player deals with all other later bosses in that kind of evolutionary branch. 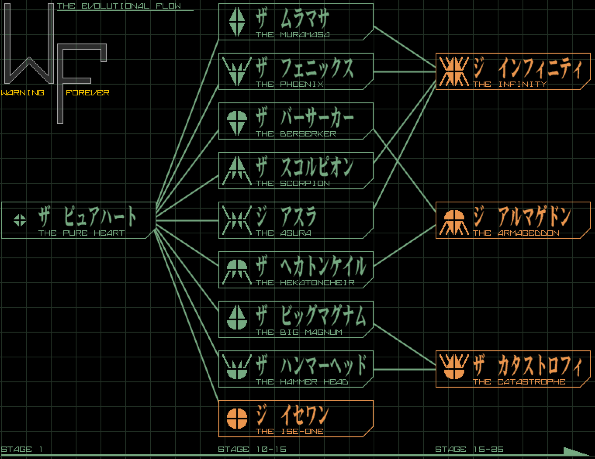 The player and the AI therefore each come to devise counter-strategies as the game continues; a skilled player (and I produce this article speaking as a danmaku world champion at time of writing) will “surgically” select which parts of which bosses to attack, and when, and in what order, in an attempt to maximize their score, defeat the bosses as quickly as possible, and push the future evolutions of the boss in the direction they want (or at the very least, prevent some of the more challenging evolutionary possibilities from coming to pass). However, this raises an interesting question about the AI’s learning from the player’s strategies: is the AI really learning from the player’s intentions (“attack the front”, “destroy the lasers”, “kill the core as quickly as possible”, etc), or is the AI simply responding to the player’s actions and the player is reading this (“incorrectly”) as being a response to the player’s intentions? Can the intentions and the actions of a player be polarized in a game with a small possibility space of direct physical player-to-game interactions (i.e. moving and shooting)? Or is it more accurate to acknowledge that the player’s intentions will translate faithfully into the player’s actions, and therefore the player is (to an extent) correct to believe the AI is responding to their intentions, not their actions, since the two are effectively one and the same? I think the latter holds: the player’s intentions are accurately represented in their actions, although this does tend to “break down” somewhat as later bosses, and the fearsome arrays of weapons they wield, often force even the best players to focus on their own survival, rather than optimizing their play in a certain way to encourage particular evolutions. Crucially, therefore: whereas in most danmaku games the player learns the bosses’ patterns, the reverse is true in Warning Forever. The bosses – or rather the AI which generates them – learns the player’s pattern, and constructs each subsequent boss to be more and more effective at defeating that particular type of player. This means that the player is forced (if one wants to seriously compete at a world-class level in this game) to adjust their strategies as the game goes on; adhering too long to certain strategies will meet with increasingly challenging foes as the AI zeroes in on the player’s strategy and adapts to challenge it. A skilled player recognizes that whilst the stream of bosses might be optimizing further and further to defeat Player Type 1, those same bosses may become easier and easier to defeat were Player Type 2 to suddenly take over the controls. A skilled player should therefore switch rapidly between many playstyles to prevent (or at least slow down) the boss becoming too challenging to defeat by progressing too far down any single dominant evolutionary tree. Going even further, there are even some “hidden” transformations – obscure “macro” evolutions of the bosses which require the player to carry out specific patterns to unlock over many dozens of iterations of the boss; and there are some evolutions of the bosses which the player can avoid by ensuring not to attack in certain ways or on certain sides of the boss. There are guides available on the internet for “forcing” the boss to adopt certain traits. An experienced Warning Forever player will likewise come to learn that certain modes of attacking will lead the boss down certain evolutionary paths. Without the use of the guides, this type of learning takes a significant period of time to understand, especially as the player needs to master the technical side of the game – i.e. the manoeuvring and shooting – to a sufficiently high level that they can survive for long enough to see some of the later evolutions in the first place and see the effects of their strategies! 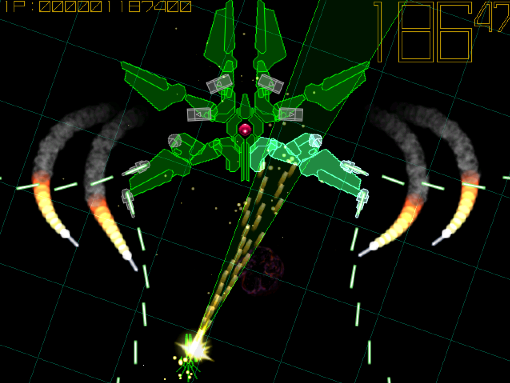 Although Warning Forever inverts the traditional direction of learning in danmaku games, and contains none of the pre-boss “stages” a danmaku player might expect, it does in other ways acknowledge and riff on expectations from the genre, even if Warning Forever’s semi-procedural generation of bosses is unique and the game contains no bullet patterns which may be rote-learned and mastered. Warning Forever is intertextual: to begin with, before each boss a “warning” sound plays. This kind of sound is common to other danmaku games, but ordinarily a rare occurrence which only takes place near the conclusion of each level. By placing this sound (somewhat “unnecessarily”) in front of every single boss – despite the fact that the player knows that the game consists entirely of bosses and therefore the warning is rather superfluous – this sound is stripped of its “warning” function and transformed into an audio signal which merely marks the passage of time and the player’s advancement through the stream of ever-changing bosses, not the completion of a level or a signal to the player to reorient their thought process towards battling a single large foe, rather than the streams of smaller, weaker opponents in a preceding level. The name of each boss is also generated, and these names are designed to echo the names of actual boss opponents from more “traditional” offerings in the danmaku genre. Such names might include “The Wing Defender”, “Hecto-Beamed Hammer Head”, “Penta-Forced Wing Arms Omega”, and so forth, with the names getting longer and containing more “sub-clauses” as the game progresses and the evolution path of the boss becomes increasingly specific. The title of the entire game itself, Warning Forever, also plays upon these ideas. The symbolism of the pre-boss “warning” has become both ubiquitous to the genre as a whole and a signifier of the genre in wider gaming culture; a moment’s online search for posters, shirts and other danmaku merchandise will demonstrate the veracity of this observation. The game thereby does away with the part of danmaku games that many don’t remember or that are considered somewhat less memorable – the stages before the end-of-stage bosses – and narrows the genre down (or, depending on your perspective, expands the best parts of the genre?) into a tighter piece of game design. Warning Forever references the traditional expectations of the danmaku genre throughout, but plays with them, adapts them, and results in a game which keeps the high levels of mastery expected from the genre, but inverts the direction of learning and pitches a unique challenge which speaks to the history (and most noteworthy parts?) of the genre, whilst producing something entirely new in the process.